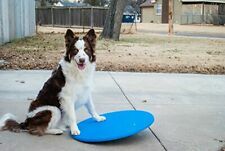 This item is our 22" wide wobble board and features No PO Boxes accepted. No exceptions! • Slip resistant paint (blue). • Solid wood pivot point. • Improves sensory & body awareness. 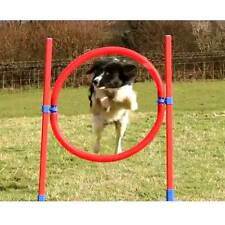 Perfect for your back garden or the park, the Rosewood Dog Agility Hoop can easily be adjusted to fit your dog�s jumping ability. It a great way to not only hone your dog�s co-ordination but also improve overall health though physical fitness. The Sport Jumping Hoop from the Agility Fun & Sport Series can be adjusted up to 70 cm as part of your own individual agility show-jumping course. The hoop can be easily adjusted to fit your dog's ability. Practice Dog Agility Hoop Jump. Due to the lighting effects, monitor settings, etc. - Easy to assemble in minutes. Practice Dog Agility Hoop Jump. - Height fully adjustable 30cm to 80cm. - Easy to assemble in minutes. Practice Dog Agility Hoop Jump. - Height fully adjustable 30cm to 80cm. Due to the lighting effects, monitor settings, etc. - Easy to assemble in minutes. Karlie Agility Reifen-Set rot/gelb. Karlie Agility Hürden-Set. Karlie Agility Starter Set. Karlie Agility Tunnel mit Sack. Karlie Agility Tunnel. Karlie Agility Slalom. Marke Karlie. Toller Freizeitspaß! DOG TRAINING AGILITY RING. components to set up the hoop all seem in tact although we cannot locate any instructions. the orange flexible ribbed hoop part seems a little misshapen but that may be from storage and and should hopefully be used as intended as a round shape when assembled. Are you an agility fan?. Design your own course with the Agility Hurdle, the Agility Slalom Poles & the Jumping Hoop. Agility Hurdle: Up to approx. 1 m hurdle for jump exercises, with adjustable height settings. Design your own course with the Agility Hurdle, the Agility Slalom Poles & the Jumping Hoop. Agility Hurdle: Up to approx. 1 m hurdle for jump exercises, with adjustable height settings. 1.1 m wide. 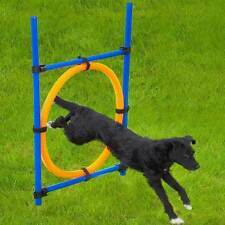 Practice Dog Agility Hoop Jump. Due to the lighting effects, monitor settings, etc. Good quality! Excellent Service! - Easy to assemble in minutes.